The man in the middle with the cap is Robert Hendry and the man at the end could be Albert Ross. 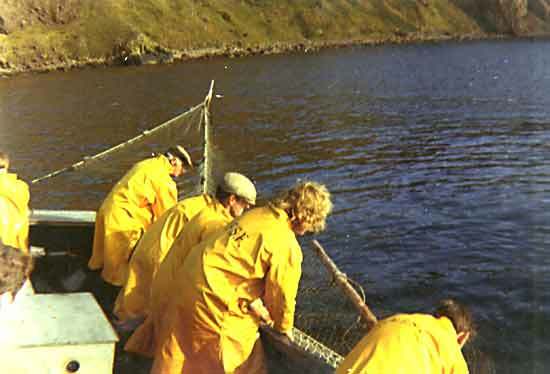 Raymond Maclean and Harry Kelly are the other two fishermen and they are working at the Blue Head nets. Date would be probably about 69/70. I first worked at the salmon fishing in 1971 and this was before then. Robert Henry is my uncle - our name is not spelt with a D.
My apologies on surname Moira, I should have known.